Christmas reminds me of old movies with my mom, hot chocolate, snow flurries, cookies, and letters to Santa. It’s my kids’ favorite time of year, and I so love making it special for them. Though, I admit to taking a more minimalist approach to holiday magic–see my list of Elf on the Shelf ideas for lazy parents. 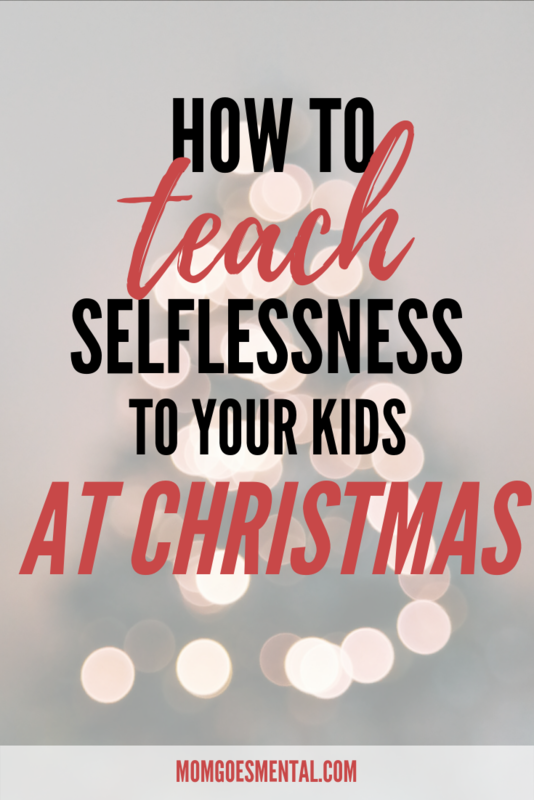 For me, this holiday season is the perfect time to teach empathy and selflessness. Not only are there so many different religious and cultural holidays being celebrated, but the spirit of the season is giving. Every year before Christmas I set a large box in the kids’ playroom, and we go through their toys together. Toys that are too broken to be played with are thrown away, and those they have outgrown are put in the donation box. Then we tackle the stuffed animal pile… I swear they’re having babies while we’re sleeping. While we’re going through the stuffed animals, the kids reminisce about their toys. Some stay because we still love them and some go because we don’t. By the end of it all, my littles are happily chatting about how excited other kids are going to be to get toys that have been so well loved. Luckily for this kinda lazy momma, my kids’ school does a huge coat drive each year. Anything left in the lost and found is donated, and a bin is placed in the lobby for drop offs from parents. Being a frugal momma, too, I save big coats that I can reuse from the older kiddos for the smaller ones. I donate the extra sweaters and light jackets we don’t need. I’ll also donate big coats if I have multiples in the same size. When I was growing up, we got 2 pairs of shoes each year. At the start of school, we got a new pair of tennis shoes, and in the winter, we got a pair of dress shoes for Christmas and Easter. That’s it. It wasn’t until I was in high school that I started getting boots, flip flops, and heels for various events. So just how many pairs of shoes my mother-in-law buys for the kids baffles me. Don’t get me wrong, they are cute, and I’m super grateful… but we often end up with more pairs than I care to save. The extras get donated, especially in the winter, as these Georgia babies don’t wear down their cold weather shoes so much. Watching other kids open presents not meant for them is part of growing up and learning to be a selfless little human. Even though everyone is getting present during the holidays, I want my kids to be thinking of others, too. With Toys for Tots, my kids do just that. We take a special trip out to the store to go shopping. They browse the toy aisles looking for just the right toy for the boy or girl they’re imagining. We even create with stories about what they might be like or where they live. >> Find a Toys for Tots donation location near you. One Simple Wish is a program we absolutely love! It’s designed to allow foster kids to request one wish be granted. Each child makes a wish, and you’re able to browse all the wishes available. I use this opportunity to talk to my kids about family dynamics and foster care in general, and I share my stories of friends I had who were in foster care. I give the kids a maximum dollar amount we can spend, and they choose which wish they’d like to grant that falls under the limit. I have not heard of One Simple Wish but I love the idea! I will have to check into that and round up other family members to make someone’s wish a reality! I would love to try these ideas with my daughter. We do give away her clothes and toys. She wasn’t too happy initially. But I am glad she understood and gave in. I dint give it away till she did it happily. Now when the clothes don’t fit her she asks whom are we giving it to. These are amazing ideas. I like the coats/shoes idea. I’ve got 3 so they are getting pretty worn but there are some that are like new (learning to walk ones). I have been wondering what to do with them and that’s a great option. I still need to work on the toys – my kids like to save every last little thing. I had never heard about grant a wish. We did the giving tree and are taking gifts to the nursing home as well as some other odd donations here and there. I love the idea of the grant a wish though so I’m heading over to choose a few with my littles! Thanks for the idea! We spend Christmas in NH, so it’s very cold. I think the coat donation might be right up our alley. Thank you so much for this reminder of how to be selfless over the holidays. That grant a wish project sounds so special. I would definitely do something like that.